​When coming off the lake today at Norfork Dam launch, another man was also leaving. He fished with Binks yesterday (8-17) and learned how to use Binks spoons. He bought several and fished alone today. 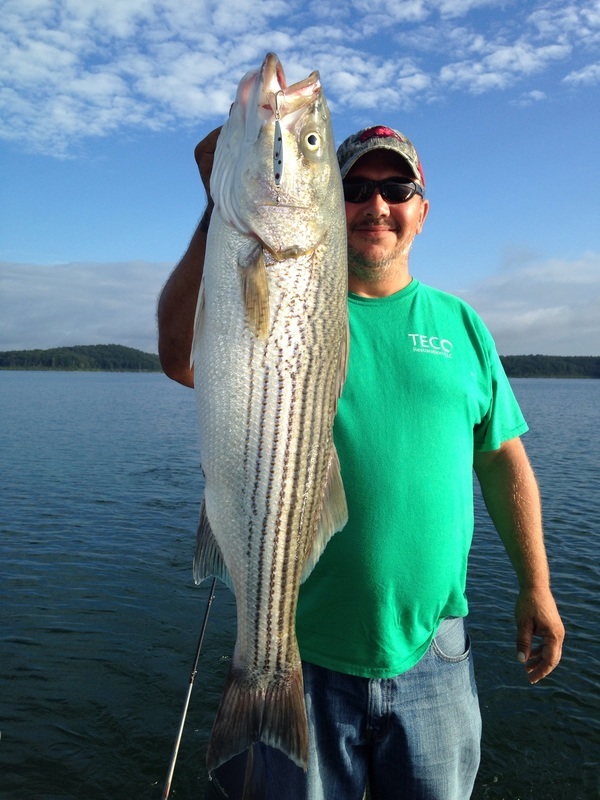 He used a white spoon with red throat and landed a 31" 12 # striper and a nice hybrid too. He is from Cabot, AR and said this was his first time coming to Norfork. He sang praises for Binks. I agreed as I've fished with Binks twice. Binks is a great guide and explains what he does so you can too. 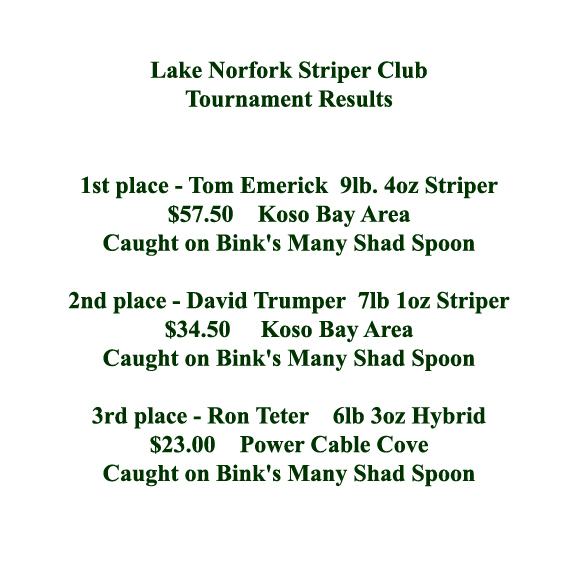 Thanks to Binks for being a great part of the Striper Club and helping all of us to be better at this thing we call "fun". This morning on Kaw Lake in Oklahoma using "Bink's Spoons"
My 8 year old granddaughter Alexis loved spooning at Lake Powell in Utah. 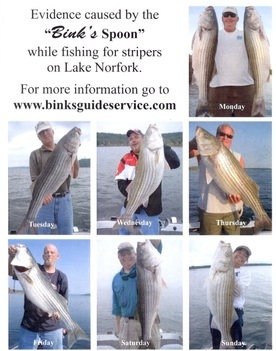 We caught around 200 stripers during the week we were there. We didn't get any big ones but the nonstop action made for a great trip The white double shad and the plain white colors accounted for most of the fish. I'd recommend the Bink's Spoon over the frozen anchovy anytime. Prefishing the Mercury/Realtree Pro-Am on Bull Shoals in mid June, PWT pro Jim Ranash catches good walleye on Bink's Pro Series spoon. "This spoon is very productive on bigger walleyes" said Jim. He also likes the colors and action of the spoon and especially the way it falls without snagging or twisting the line. Look for the article on Binks Pro Series Spoons by outdoor writer Tommy Garner in the News & Fish Of The Week page. Darrel,The bite is on. Here is a 28+ inch, 7 lb 2 oz, walleye I took on July 26, 2009 on Bull Shoals lake. The fish was taken on a Bink's spoon in 45 ft of water. Your spoons and jigging techniques have revolutionized the way we fish for walleye. Thanks!! ​This is some of the hybrids, whites, and walleye that we (Eddie Shaffer, Logan Shaffer, Clint Lemke, & Jim Shaffer) caught on Milford Lake, Kans. 7/16/11. All were caught on Binks Spoons. The "many shad" was the favorite but also caught some on the green back, the clown, and the black backed ones. The fish were on the bottom at 28' to 32' deep. We caught a total of over 40 fish in 3 1/2 hrs. IT WAS A GOOOOD DAY.